Australian researchers funded by the National Heart Foundation are a step closer to a safer and more effective way to treat heart attack and stroke via nanotechnology. 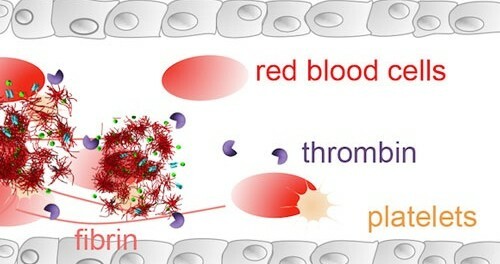 The research jointly lead by Professor Christoph Hagemeyer, Head of the Vascular Biotechnology Laboratory at Baker IDI Heart and Diabetes Institute and Professor Frank Caruso, an ARC Australian Laureate Fellow in the Department of Chemical and Biomolecular Engineering at the University of Melbourne, was published today in Advanced Materials (“Multifunctional Thrombin-Activatable Polymer Capsules for Specific Targeting to Activated Platelets”). Professor Hagemeyer said this latest step offers a revolutionary difference between the current treatments for blood clots and what might be possible in the future. This life saving treatment could be administered by paramedics in emergency situations without the need for specialized equipment as is currently the case. “We’ve created a nanocapsule that contains a clot-busting drug. The drug-loaded nanocapsule is coated with an antibody that specifically targets activated platelets, the cells that form blood clots,” Professor Hagemeyer said. “Once located at the site of the blood clot, thrombin (a molecule at the centre of the clotting process) breaks open the outer layer of the nanocapsule, releasing the clot-busting drug. We are effectively hijacking the blood clotting system to initiate the removal of the blockage in the blood vessel,” he said. Professor Frank Caruso from the Melbourne School of Engineering said the targeted drug with its novel delivery method can potentially offer a safer alternative with fewer side effects for people suffering a heart attack or stroke. “About half of the people who need a clot-busting drug can’t use the current treatments because the risk of serious bleeding is too high,” he said.